Replacement rechargeable 1.2V NiMH electric toothbrush batteries with solder tags. We have batteries to fit Braun Oral-B, Philips Sonicare, Colgate and more. Here is our range of electric toothbrush replacement batteries. We have rechargeable batteries to fit Braun, Oral-B, Philips Sonicare, Colgate and other rechargeable toothbrushes. If you are practical and able to do some simple soldering then you will be able to change the battery in your electric toothbrush. There are plenty of guides available on the internet, either as videos or step by step pictoral guides that will show you how its done if you aren't sure. 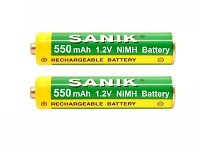 It's a good idea in most cases to check the dimensions and type of battery you have prior to ordering your new rechargeable NiMH battery as there are several different sizes to choose from. If in doubt, we are here and happy to help.